For some patients a lower lid blepharoplasty can be combined with fat injections to enhance the cheeks or midface where there is hollowing due to loss of fat. Coleman fat injections can also be used as a totally separate aesthetic procedure e.g. for hollowing of the temples, and cheeks. 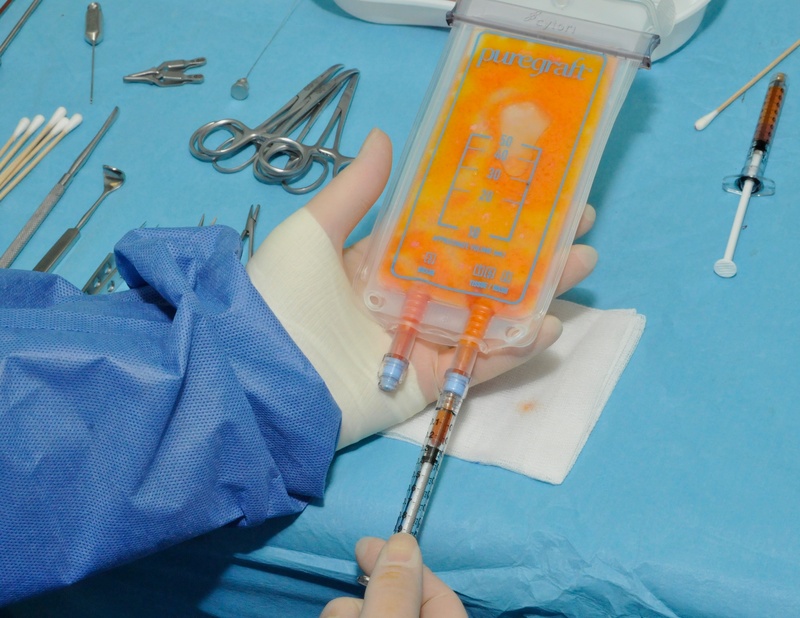 The newer technique of microfat grafting, using finer cannulas, can be used for the outer tear trough areas and lid-cheek junction in suitable patients. In this procedure, fat is removed from the outer aspect of the flank, buttock or thigh using very light finger suction with a syringe and a special harvesting cannula to avoid damaging the fat. This can be done under “twilight anaesthesia” or under general anaesthesia. A single small “stab” incision is required in the skin and this is closed with a single stitch. The fat is then washed in a closed filtration bag (a “Puregraft®” bag), separating the fat cells from blood and local anaesthetic solution. See photographs below. Harvested fat has been injected into the filtration bag and washed with Hartmann’s solution. The solution is being drawn off with a syringe. 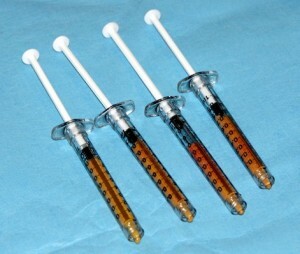 The pure fat cells are now withdrawn into a series of 1ml syringes ready for injection. The fat is then injected conservatively into the cheek area via a small skin incision using a sterile needle, in very small quantities. Several passes of a small blunt tipped cannula are made to ensure an even, smooth distribution and the best chance of the fat gaining a blood supply in the facial tissues and thereby surviving. There is nevertheless a risk of approximately 10% that the fat will not survive this process. The risk of failure is higher in smokers and for this reason this procedure is not advised for such patients. The procedure can be repeated but the fat has to be harvested again as it cannot be stored (stored fat is not viable). What are the possible complications of Coleman fat injections (structural fat grafting)? Blurred or double vision, lasting mainly for a few hours, and sometimes up to a day or two after surgery. This may occur for several reasons – ointment put in the eyes immediately after the operation, local anaesthetic used in the operation, swelling of the muscles that control eye movement or swelling of the normally clear covering around the eye (the conjunctiva). Swelling of the conjunctiva (this may mimic a severe hay fever reaction) is referred to as “chemosis” and in some patients can take a few weeks to resolve. If blurring persists for longer than 48 hours, it is important to inform your surgeon. Blindness, a stroke, or skin loss from facial fat injections are extremely rare complications reported in the medical literature. Mr Leatherbarrow has undertaken facial fat injections for over 20 years with no serious complications. Bleeding. A collection of blood around the eyelids or in the face is called a haematoma. A haematoma usually needs to be drained in the operating theatre. 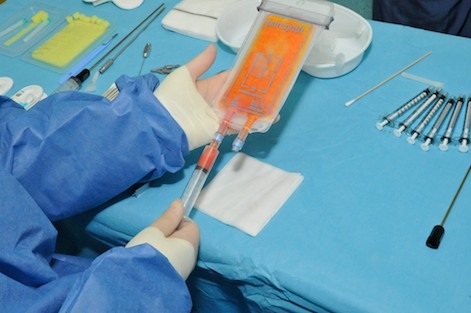 Under or over-correction of the grafting. This may necessitate further surgery. Atrophy of the transplanted fat. This affects a small percentage of patients and is the reason why the procedure is not advised in smokers who have a poor microvasculature. The failure rate also increases in patients over the age of 60. The procedure can be repeated if necessary. Asymmetry. It is impossible for any surgeon to achieve perfect symmetry although an oculoplastic surgeon strives to achieve this. A cosmetically unacceptable degree asymmetry is always possible (but rare) and further surgery may be required to address this. Scarring. Most small eyelid and facial wounds heal with scars that are barely perceptible although full maturation of the wounds can take some months. Poor scarring can follow infection or wound disruption but this is very rare. Poor scars can be treated with steroid injections or with the application of silicone gels e.g. Kelocote. Eyelid lumps. Lumps can very occasionally occur as a reaction to the injected fat. These usually resolve with time and postoperative massage. Rarely steroid injections are required. Because the eyelid skin is so thin, only microfat is used for the eyelids and this is usually done in the outer aspect of the eyelids, at the eyelid cheek junction. If fat is needed to improve eyelid hollowing in the inner and central areas of the lower eyelids, it is better to undertake fat pearl grafting instead. What happens after Coleman fat injections (structural fat grafting)? You will be asked to clean the eyelids and face very gently using clean cotton wool and Normasol (sterile saline) or cooled boiled water and repeat the application of antibiotic ointment (usually Chloramphenicol or Soframycin) to the small wounds 3 times a day for 2 weeks. The very small skin scars gradually fade to tiny fine white marks within a few months. You are advised to sleep with the head raised approximately 20-30 degrees. It is preferable to raise the head of the bed if possible. A period of postoperative massage is often advised following this surgery. You will be shown how to do this. It is usually undertaken after applying some Auriderm cream to the eyelid/cheek skin. The massage helps to reduce swelling. It is usually undertaken for 3 minutes 3 times a day in a side to side direction. Click here to view video of a patient describing her experience of “twilight anaesthesia”. She underwent a bilateral upper lid blepharoplasty and endobrow lift at the clinic. To learn more about Coleman Fat & Microfat Injections, please contact us at today to schedule an appointment.